But to pursue virtue and knowledge. In the few minutes that remind them that they are human beings rather than brutes, Levi begins to instruct his fellow prisoner in Italian. The pastoral echoes of this sunny moment in the midst of suffering link it --in "the conversational ease at noontime" (p. 5), in the warmth of the day, in the amiable nature of their dialogue, in the long walk through the countryside, even in the recitation of verse-- to Virgil's ninth Eclogue and thus to its source in Theocritus and to the pastoral tradition in general. Such an introduction is startling, especially when one recalls that pastoral as a mode has long been characterized as frivolous or escapist, a condemnation voiced by some of its most astute commentators, for instance, William Empson in Some Versions of Pastoral (1932). Alpers intends to overturn this negative view of pastoral. In a series of closely argued readings, he demonstrates that pastoral can hardly be presumed to be an escapist mode simply about the "beautiful relation between rich and poor. "Rather, within its own conventions, pastoral has been concerned with significant issues of representation from its beginnings (p. 137). Alpers suggests that the pastoral mode starts from the situation of exemplary herdsmen whose relation to the world dictates a certain attitude of collaboration and compensation, as well as resonates with large purported meanings. He studies pastoral through the notion of" representative anecdote," a term he borrows from Kenneth Burke. By "representative anecdote" Alpers means "a form in [the] mind that conveys[a person's] sense of the human value of literature" (p. 6) or, in another formulation, "a brief and compendious rendering of a certain situation or type of life" (p. 22). 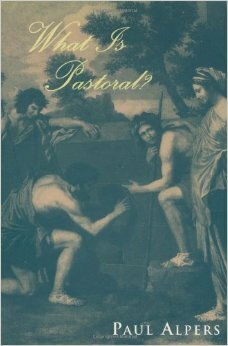 The first half of the study focuses on large questions: What is pastoral? How can the phrase "representative anecdote" be understood as defining poetic form? Why is pastoral not a genre but a mode? What is the nature of convention, especially in the self-consciously allusive and often ironic form that is pastoral? The poets Alpers draws on to elucidate these issues --Theocritus, Virgil, Spenser, Sidney, Shakespeare, and Marvell--return in the second half of the volume, which paints the historical transformation of the mode in subsequent lyric and narrative. Although Alpers focuses on English literature in the latter part of his analysis, the study is richly comparative in its range from Greek and Latin to English, with excursuses on Italian, Spanish, and French examples. Alpers balances against each other texts that define historical difference. His readings are remarkably free of a teleological paradigm of progress or of a rigid insistence on continuities. He does not aim to surprise, he says. And yet, simply by getting us to question evidence we had long taken for granted, his readings do surprise as they unfold structures of meaning that bring the pleasures of the text to life. Typical of his critical approach is his thesis that the poet is a "collaborator in critical analysis and definition." Long after we have set the book aside, we seem to hear the voices of the poets convened for this exchange, continuing in the distance. Alpers addresses us almost conversationally, weighing the consequences of particular premises and presenting close readings of test cases, set side by side for us to observe the differences. His exploration of the topic reminds us of the intimate connections between criticism and instruction, showing how deceptive familiar terms can be, and convincing us that as critics we must always confront the most general issues as well as the telling selection of individual words. This magisterial book is learned and humane, traditional in its subject matter yet innovative and thought-provoking in its analyses. Few books published today are informed by such a generosity of spirit and sureness of literary and historical judgment. Alpers' is a work of splendid maturity which argues, not coincidentally, for the continuing relevance of literature itself to the way we lead our lives.